Three weeks ago, as I got off an airplane in Newark NJ, I unexpectedly suffered a minor stroke. I recovered quickly but there were definitely some lessons learned – not only for me, but for all of us (here’s the story: A Scary Moment in Terminal A). 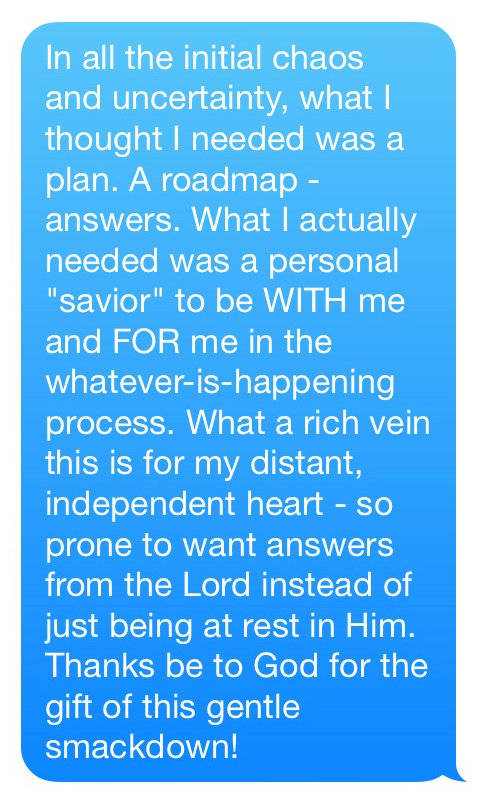 However, there was another lesson learned which I’d like to share on this personal blog. And it has to do with what God showed me about Himself through the kind ministrations of one very special nurse. The first two days (Tues. and Wed.) in Morristown Medical Center were somewhat confusing, as the initial testing was inconclusive about the occurence of a stroke (had to wait for an MRI that kept getting delayed), plus there was some instability about my room situation. 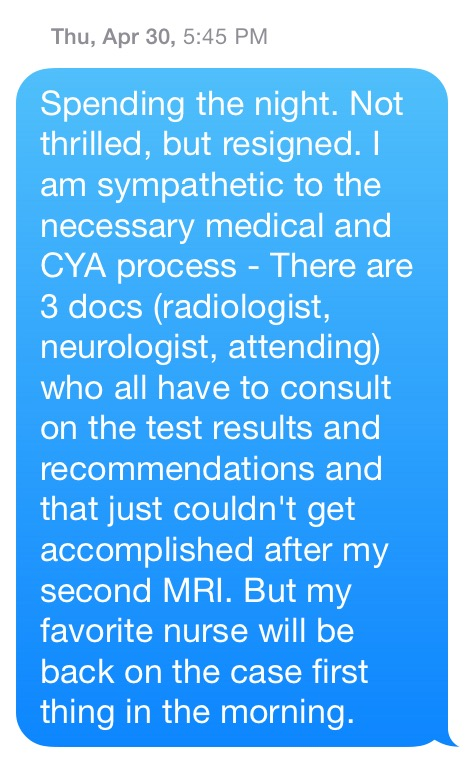 The care was certainly professional; but I was feeling anxious because I wasn’t getting answers – about the diagnosis, about the pending MRI, and about whether I’d be able to leave on my scheduled flight at the end of the week. Enter Nurse T____________ (I won’t use her name, because I’d like to think that this story actually describes the care and concern of thousands of nurses who aren’t individually praised in any blog post). Nurse T____________ came to my bedside Thursday morning and listened to me. But she did far more than that….she took immediate, personal action. – She pushed to make the MRI happen immediately – and it did. – She pro-actively interacted with (chased down!) the doctors to start getting some answers. – She noted that I’d had a headache from lack of coffee that morning and said she’d take care of that the next morning. 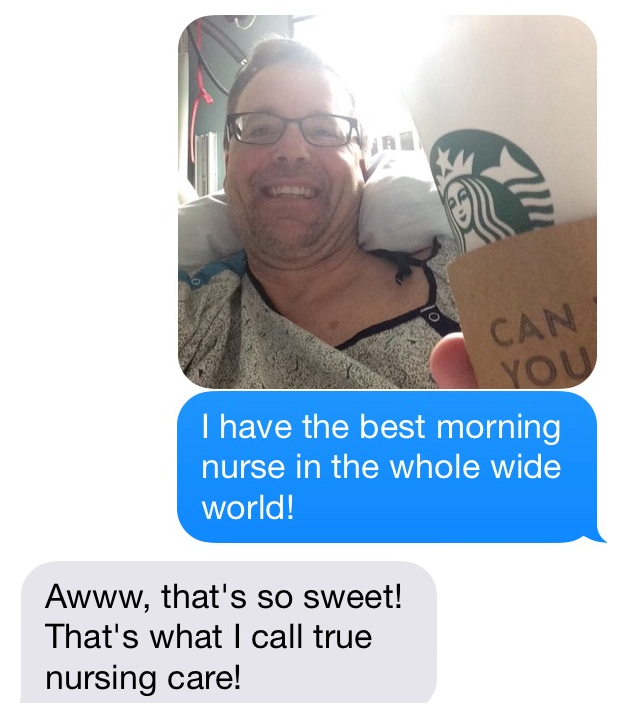 And sure enough, as soon as her shift started that next day, she delivered me a cup of Starbucks that she bought just for me. 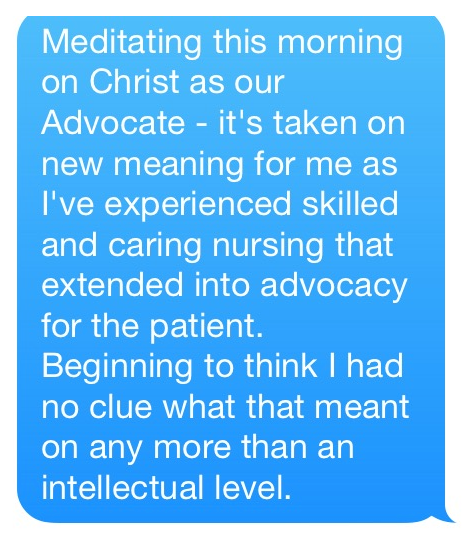 In other words, she became my advocate – and not only me, of course, but all of her patients on the floor. But – she very much took a personal and pro-active interest in my well-being and exuded warmth and supportiveness along with professional competence. The effect this had on me? I finally relaxed. I was in good hands. 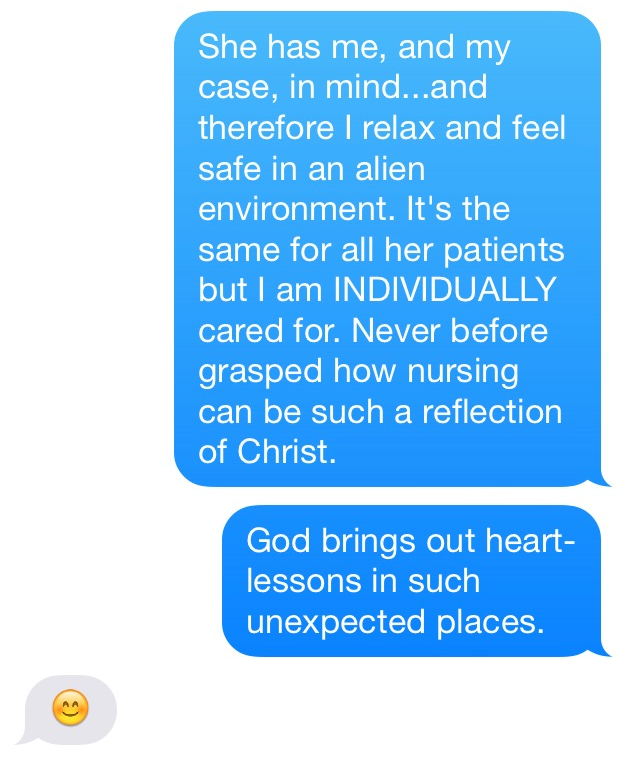 The right person was on my side, helping navigate the bewildering world of the hospital setting. I didn’t need to feel like it was up to me, in the midst of my confusion and ignorance, to make everything happen. So, for all of you nurses out there – including Nurse T____________ – a profound thank you from your patients who value what you do, on the floor and from the heart. And if you are a servant of Christ serving in a hospital setting, you may never know how God may reveal Himself through you. The stroke, I’d just as soon not repeat. 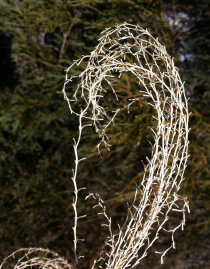 But the rich vein of love and truth that has warmed my heart as a result – I’ll treasure that forever. The human heart – my heart – is a raging ocean of desire. Waves of sinful passions, selfish wants, impure lusts – foaming, tossing, a turbulent sea of unbridled pollution. Yet Jesus stands amid the turmoil and says, “Hush, be still.” And His Spirit descends, and calms the surging violence. Jesus stills the most uncontrollable tempests. With a divine word of power. It was a miracle when He did this overpowering act during a seething storm on the Sea of Galilee. It’s even more a miracle when He dampens my madness-driven heart and brings the peace of His presence each day. He couldn’t even walk there himself. The remarkable rabbi was nearby. The one who was healing people with all sorts of diseases. But he couldn’t make the trip on his own. You see, he was paralyzed. His friends had to carry him to Jesus. What followed was both remarkable and outrageous. Go ahead – read Matthew 9:1-8. “Sorry, dude. That’s too tough a case for me.” No. “Hey, thanks for coming! Have you checked out Galilee Memorial Hospital? – they have a great setup for paralytics!” No. “Why, look at the time! Gotta go, folks, see you all next week.” No. The religious scholars in the crowd were utterly appalled. A man, pronouncing forgiveness of sins?? Blasphemy! Now, of course, anyone could SAY they forgive someone’s sins – it may be blasphemy, but who can prove him wrong? It’s just words, after all. Which the man, undoubtedly grateful and thoroughly amazed, promptly did. Publicly. Right in front of all the skeptics. Compassion? An outrageous display – way beyond what was hoped for. The man and his friends came hoping for the miracle of movement; they left with that and the miracle of forgiveness. The skeptics, meanwhile, only left with perplexed anger. What is holding us back from coming to this compassionate, authoritative, spiritual physician? If the Son of Man/Son of God is pronouncing (and effecting) spiritual healing, then by all means, we should be coming to Him with faith. There’s a lot of talk about greed in our society these days – the greed of the rich, the greed of politicians – even the greed of the unproductive. While we might like to think that we live in a uniquely depraved time, in fact, there truly is nothing new under the sun. If we look back through human history, for however many thousands of years, two of the underlying bass notes of the performance have always been pride and greed. And death. While government will never be able to “fix” greed, there is one sure-fire cure. Give ear, all inhabitants of the world, both low and high, rich and poor together…Even wise men die; the stupid and senseless alike perish and leave their wealth to others. Their inner thought is that their houses are forever…but man in his pomp will not endure; he is like the beasts that perish…Do not be afraid when a man becomes rich, when the glory of his house is increased; for when he dies he will carry nothing away; his glory will not descend after him. Stark, yes? And unavoidably true. When our eyes ascend to the feeble and temporary heights achieved by those who accumulate wealth and power, we often feel a sense of fear, of outrage – and a need to bring them down. But this is because our gaze does not ascend high enough – to a just and holy God who looks with far keener eyes upon the pride and pitiful wealth of men. Rich and poor alike are like a flower in spring – vibrant but for a moment, then soon gone. Not a single greedy, wealthy, arrogant baron who elevated himself a few millimeters above his fellow man in the 1800’s is still around to be feared. And when we look around at the living faces of people in our generation – they, and we, will soon be gone. God, however, remains – unmoved, unchanged, unsullied by our sin. He is the one to fear. He is the one to depend on. His justice will make things right. We can’t “fix” greed – all attempts to do so by human means are misguided. We can enforce laws against illegal behavior, but a pure heart is beyond the reach of societal and governmental enforcement. We can, however, look ahead to the end of greed, and see that it cannot and will not endure. The Lord, our Redeemer, will see to that. There’s plenty enough for our attention to be cleansed of the greed that infests our own hearts. God can see to that, too. Mary was just minding her own business. A virgin, engaged to Joseph, she very likely did not view herself as a potential world-changer. As a uniquely and highly favored person in the sight of the Lord. As one who would know a “God with us” in a way that, body and soul, no-one else ever could. Via an unanticipated without-Joseph pregnancy, she would bear a Son whose impact on the following generations would be unfathomable. One whose kingdom would have no end. Whatever perplexities we’re facing, if God is with us, we’re richly blessed. If the Lord has favored us with his nearness, and chosen us for His service, we are wealthy beyond measure, even if poor in this world’s goods. And He calls us to mind-boggling things. Forsaking treasured sins. Giving up self-direction. Turning our backs on the allure of the world. Holiness. Singleness of heart. Things impossible for mere men. But possible with God. Only possible with God. Some people deny the existence, or presence, or activity of God. When you see a follower of Jesus with a submissive and trusting heart, a former slave to selfishness and sin who now (even just in part) walks a different path out of worship and love, you are seeing a divine work. You are seeing the life of God implanted in a chosen one. You are seeing Emmanuel – God with us. For those who will not see God, there are always alternative explanations to be manufactured. Denial is the daily lot of the unbeliever. Unbroken natural process is the dogma that defines what is possible. For those who believe but know the confusions (and even tragedies <–I never knew this backstory until this morning) that swirl about in our fallen world, there will always be unresolved questions (esp. the ones starting in “Why….?). But there is one exclamation point that is simply self-evident regarding the one God who has created heaven and earth and all that is in them. The Unlimited One doesn’t feel the handcuffs of “the impossible.” As King, He does whatever He chooses. Even if it involves sovereignly blessing His chosen servants, and bypassing the laws by which He set up His universe. Confusing at times? Yes. But a blessed confusion. God prospers those who delight in His law. God knows the way of the righteous. God ensures that the wicked will not, ultimately, prosper. God is King way above all earthly kings; He rules. He is wrathful toward sin, yet also the refuge from wrath. The nations are, and will be, His inheritance. He lifts up the head of His trusting people. He sustains His people and delivers them from fear. Salvation and blessing belong to the Lord. He relieves us in our distress. He is gracious and hears the prayers of His people. He sets apart the godly man/woman for Himself. God’s countenance is of light, shining on His people. He puts gladness in our hearts. He makes His people dwell in safety. He gives ear to our words and groanings. God takes no pleasure in wickedness; the boastful will not stand before Him. He is a God of abundant lovingkindness. He has given us a “house” in which we have access to His presence. Those who take refuge in Him are glad. The Lord blesses the righteous person. He is gracious and heals. The Lord judges all the peoples; vindicating the righteous. He tries the hearts and the minds; and saves the upright in heart. As the Lord Most High, He is worthy of praise. His Name is majestic in all the earth. 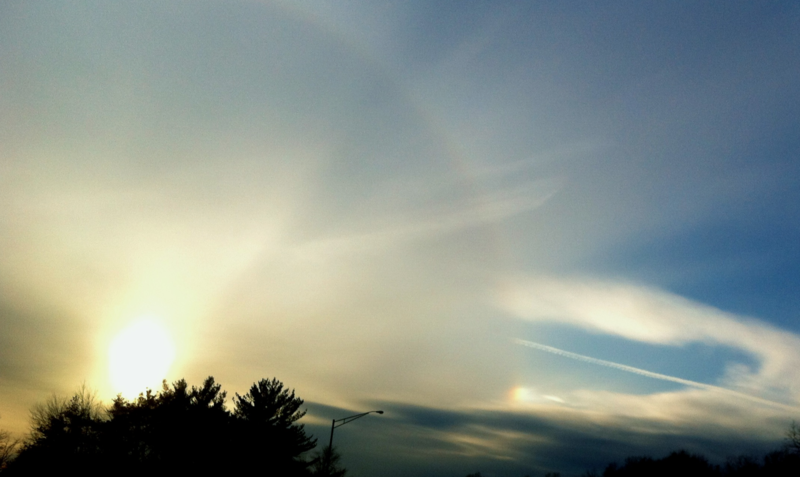 His splendor is displayed above the heavens. The heavens are the work of His fingers. Though He is vast and all-powerful, He takes thought of/care of mere men; He makes us special above all other creatures. He is a God of wonders. He rebukes and uproots those who oppose Him. God does not forget the cry of the afflicted. He lifts us up from the gates of death, that we may tell His praises. The Lord has made Himself known. When men say, “God has forgotten; He has hidden His face; He will never see it” – that’s a pure delusion. God hears the desire of the humble, and vindicates the orphan and the oppressed. The words of the Lord are pure, as silver tried in a furnace, refined seven times. The Lord deals bountifully with those who trust in His lovingkindness. God is with the righteous generation. The Lord restores His captive people and makes them glad. We may abide in His tent, and dwell on His holy hill. He is the source and fountain of all good. The Lord is our inheritance. He is at our right hand. In His presence is fulness of joy; in His right hand there are pleasures forever. And that brings us all the way through…just Psalm 16. Let alone the other 134 Psalms, and the rest of the Scriptures! Of course, to be on the wrong side of righteousness and justice and purity of heart is a frightening thought – because, as each hour of every day abundantly reveals, we are all thoroughly corrupt. Yet, in Christ, God Himself clothes us in forgiveness and a righteousness that only He can impart. We are urged to “set our minds on the things above.” These bright shades of greatness, and many, many others in the Scriptures, are for more edifying than anything else. They are riches given us to make our hearts glad – let’s do just that today!